Discover the amazing sensation of scuba diving in Gran Canaria. 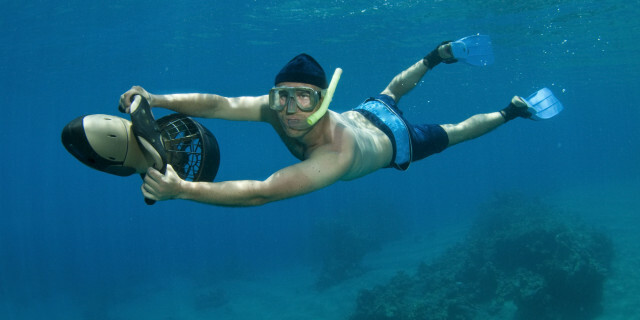 Explore the underwater world and enjoy a unique life experience. The minimum age to participate is 10 years old. Participants need to swim at a basic level. We offer a free pick up and drop off service in the south of Gran Canaria (Puerto Rico, Puerto de Mogan, Playa de Mogan, Taurito, Tauro, Playa del Cura, Arguineguin, Playa del Ingles, Maspalomas, Melenores, Bahia Feliz, and Salobre Golf). Your booking will become valid after we receive your payment and send you a confirmation email. You can cancel up to 24 hours in advance with 100% money reimbursement. There is no reimbursement for later cancellations. In case of cancellation from our side due to bad weather, we will return your payment in full. The nature in Gran Canaria is so diverse that the round-shaped island is known as a “miniature continent”. From desert-like dunes to white-capped mountains - when it comes to nature, the extraordinary landscapes of this small territory have it all. Gran Canaria’s diversity is also visible along its coast. Sea life such as octopus, cuttlefish, pipefish, and stingrays - among others - live in the underwater world of this side of the Atlantic. Even species of harmless sharks often visit the area, mesmerizing the lucky visitors. 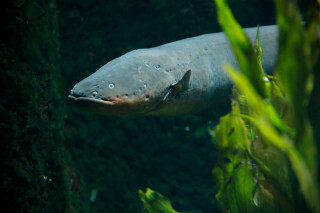 With such creatures, a mild climate, and ideal water temperatures, the island welcomes divers year-round. 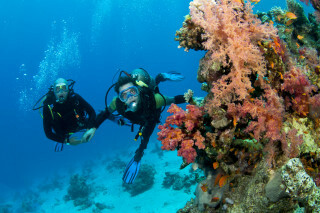 Now it is your turn to try the thrill of scuba diving and explore the fantastic underwater world of Gran Canaria. You don’t need any particular skills to take part in this activity. As long as you can swim at a basic level, you will be completely fine. 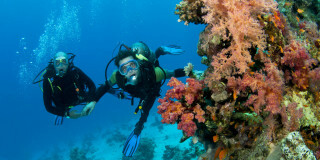 Firstly, your professional instructor teaches you basic safety rules and explains how to operate the diving equipment. After that, you go through a series of exercises, which is followed by a 40-minute guided dive. For your safety, your instructor is with you at all times, step by step, until you reach a depth of up 6 meters (20 feet). Our diving center is just a few meters away from the shore. 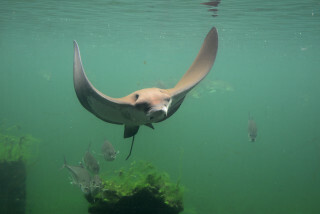 It is a smooth and lovely dive spot where you can see different species of sea animals. This is your chance to discover unknown worlds and enjoy a unique life experience. Take an Open Water PADI course in the turquoise waters of Sardinia and embark on an underwater excursion in one of Europe's best diving locations. 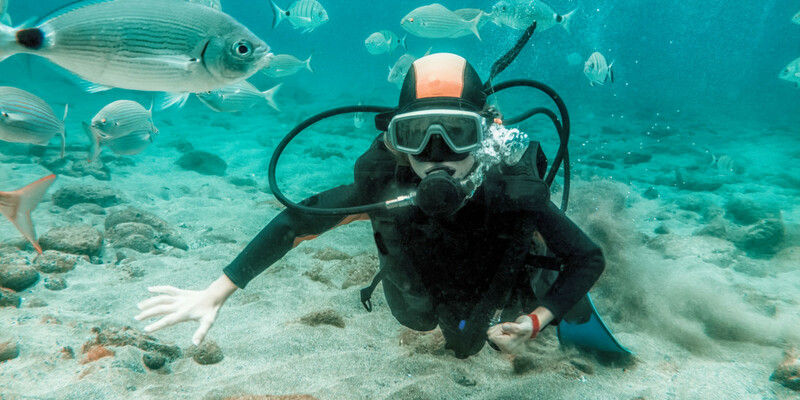 Explore the underwater world of Gran Canaria, and add a good dose of adrenaline to your snorkeling with the use of sea scooters. Take your scuba diving skills to the next level with this course in the turquoise waters of Sardinia. Embark on an underwater excursion in one of Europe's best diving locations. We are running, climbing, hiking, cycling, yoga-ing nature lovers who want to share the best of this world with you. You were a terrific resource for planning our trip. Thank you so much for all of your effort! We will look forward to using Outdoor visit again as we hope to plan many future vacations like this one! The displayed amount is for reference only and based on exchange rate published by ECB. Transactions are carried out in EUR.